The Fall Armyworm is eating its way through Africa, and we – the U.S. Government along with an array of private sector, research, university and donor partners – are contributing to a global effort manage the pest before it causes a food crisis across Africa. This very hungry, invasive caterpillar is especially alarming because it eats the stems, leaves, and reproductive parts of over 80 species of plants, destroying crops completely. It reproduces quickly and, once it becomes a moth, it can fly 1,600 kilometers (1000 miles); since 2016, it already has reached 38 countries in Africa. The voracious fall armyworm is resistant to many conventional pesticides and particularly targets maize, a crop that 300 million people across Africa rely on for food and income. By comparison, imagine if over 60 percent of Americans were at risk of going hungry because their main food source was being devoured by a new, foreign pest. In addition to the growing threat of famine, a number of countries across Africa are seeing huge economic losses from fall armyworm. Crop losses in maize, sorghum, rice and sugarcane are estimated to be $13 billion. However, this figure doesn’t account for the up to 80 other plant species fall armyworm eats, nor does it account for subsequent seed loss for the next growing season. 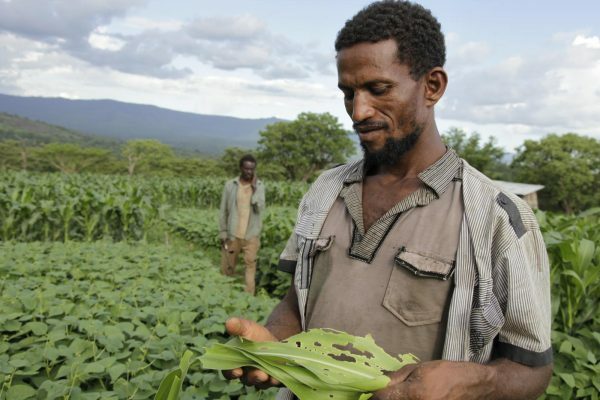 Last year in at least one district in Ethiopia, for example, fall armyworm caused up to 73% maize crop losses, further stressing already fragile, poor rural communities. Left unchecked, the fall armyworm could continue to cost an estimated $3 billion a year, or more, according to the U.K.’s Center for Agriculture and Bioscience International. The good news is, scientists and farmers have stopped this insect before, successfully controlling it in the Americas. We’ve done it by using old and new pest management practices as well as the best science and tools available, from crops with built-in resistance to smart, safe pesticide use. And we have called upon government, public, private, civil society, research, and university sectors to channel those tools once more to tackle fall armyworm in Africa. Only by working in partnership we can combat this pest. Feed the Future, in partnership with Land o’Lakes Inc. and the Foundation for Food and Agriculture Research, is launching the Fall Armyworm Tech Prize to source digital solutions that can provide African farmers with new tools and approaches to identify and fight the pest and prevent further damage to their crops. We are particularly interested in digital solutions because they have demonstrated incredible impact and cost-effectiveness — from helping to stop Ebola to providing affordable, off-grid energy and delivering babies safely in rural communities. We are seeking to harness the ingenuity and creativity of entrepreneurs from the United States and around the world to help combat fall armyworm. The Fall Armyworm Tech Prize will tap into existing technologies and innovations – either to expand the reach of existing fall armyworm tools or to encourage the adaptation of products developed for other applications (even outside of international development) – that can be used to empower farmers to detect and stop the spread of the pest. The prize offers entrepreneurs a chance to quickly test a new product line in a new market. They’ll also get rapid feedback from end users – the smallholder farmers in Africa fighting to keep their families fed and their crops and livelihoods intact. Participants will connect with new partners and investors from around the world and receive a monetary award. Interested in helping us stop fall armyworm and future agricultural pests in its tracks? Learn more about the prize and how to submit your digital solution here. Join an upcoming webinar on April 18th at 13:00 GMT to speak to prize organizers directly, and follow @GlobalDevLab and @FeedTheFuture for the latest updates. Fall Armyworm Is Here to Stay. But We Can Manage.